2.1.Approach I : From your admin dashboard. 5.How to setup front page as shown in the demo? 5.2.Set up Homepage Sections as in demo. 7.How to manage Site Title, Logo, Tagline and Site Icon? 8.How to manage Colors Options? 9.How to manage Header Image ? 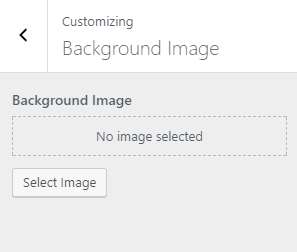 10.How to manage Background Images? 11.How to manage Theme Options? 11.1.How to manage Header Settings Options? 11.2.How to manage Archive Settings Options? 11.3.How to manage General Settings Options? 11.5.How to manage Breadcrumb Settings Options? 12.How to manage Home Page Options? 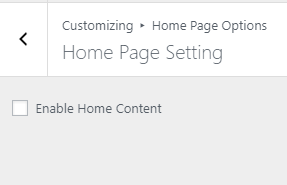 12.1.How to manage Header Page Settings Options? 12.2.How to manage Featured Slider Options? 13.How to manage Typography Options? 13.1.How to manage Font Family Setting? 13.2.How to manage General Color Setting? 13.3.How to manage Header Color Setting? 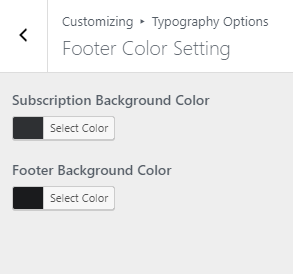 13.4.How to manage Footer Color Setting? 13.5.How to manage EM:Woo New Arrival Widget ? 13.6.How to manage EM:Product Carousel Widget ? 13.7.How to manage EM:Woo Tabs Category Widget ? 13.8.How to manage EM:Featured Product Widget ? 13.9.How to manage EM:Categoires Collection Widget? 13.10.How to manage Testimonial Color Setting? 13.11.How to manage Latest Blog Color Setting? 14.1.How to create a Menu? 14.2.How to change Menu Locations? 15.1.How to manage widgets ? 16.How to manage Static Front Page? 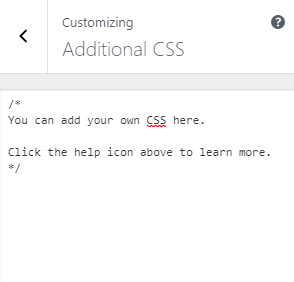 17.How to manage Additional CSS? eCommerce Market Pro is a WooCommerce WordPress theme suitable for eCommerce websites of any market type: such as mobile & tablet market, laptop market, online book market, fashion market, sport market, digital market, cosmetics market, jewelry market and for multipurpose online markets. Its modern design is perfect to create a website for business. eMarket also provides plenty of customization options such as Customizer theme options, background image, SEO optimized, fully responsive, fast loading. After you purchase and download your theme from Theme Palace you can choose either of the approaches given below to install your theme. Click Browse Locate ecommerce-market-pro.zip Theme in your computer. Select ecommerce-market-pro.zip and click Install Now. Unzip ecommerce-market-pro.zip.zip to your Desktop. Using an FTP client to access your host web server, go to /wp-content/themes/ and upload your new copy of eCommerec Market Pro Theme. You will see the eCommerce Market Pro theme in the list. Theme supports some helpful WordPress plugins to enhance your site. To manage plugins, in admin panel, go to Appearance -> Install Plugins. After activation of the theme by default, you will see the list of posts on home page. You can change home page into sections as shown in the demo. For that, you need to setup static front page. Hover over the “Pages” menu. Add title “Home” or any title you want. Site Identity and Primary Menu Section: The Site Identity section is setup from Admin Panel / Appearance / Customize / Site Identity and for Primary Menu section you need to create a menu and assign its location to Primary Menu going to Admin Panel / Appearance / Customize / Menus / Menu Location. Search Form, Login Button, Cart in Header in enabled/disabled from Admin Panel / Appearance / Customize / Theme Options/ Header Setting. Refer below How to manage Site Title, Logo, Tagline and Site Icon? , How to manage Menus? and How to manage Header Setting? for more detail. 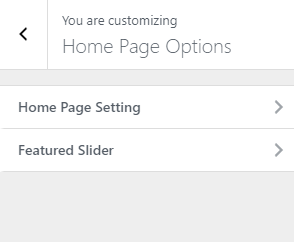 FEATURED SLIDER: This section is set up from Admin Panel / Appearance / Customize / Home Page Option / Featured Slider . Refer below How to manage Featured Slider Option? for more detail. CATEGORIES COLLECTION: This section is set up from the widget.So you need to go to Admin Panel / Appearance / Customize / Widget / Home Page Section widget area and add EM: Categories collection. Refer below How to manage theme available widgets? for more detail. FEATURED PRODUCTS: This section is set up from the widget.So you need to go to Admin Panel / Appearance / Customize / Widget / Home Page Section widget area and add EM: Product Carousel. Refer below How to manage theme available widgets? for more detail. NEW ARRIVAL: This section is set up from the widget.So you need to go to Admin Panel / Appearance / Customize / Widget / Home Page Section widget area and add EM: Woo New Arrival. Refer below How to manage theme available widgets? for more detail. ON SALE: This section is set up from the widget.So you need to go to Admin Panel / Appearance / Customize / Widget / Home Page Section widget area and add EM: Product Carousel. Refer below How to manage theme available widgets? for more detail. BIGGEST SUPER SALE: This section is set up from the widget.So you need to go to Admin Panel / Appearance / Customize / Widget / Home Page Section widget area and add Image widget. Refer below How to manage theme available widgets? for more detail. TRENDING NOW: This section is set up from the widget.So you need to go to Admin Panel / Appearance / Customize / Widget / Home Page Section widget area and add EM: Categories Collection. Refer below How to manage theme available widgets? for more detail. CHOOSE YOUR GADGET This section is set up from the widget.So you need to go to Admin Panel / Appearance / Customize / Widget / Home Page Section widget area and add EM: Categories Collection. Refer below How to manage theme available widgets? for more detail. SERVICE This section is set up from the widget.So you need to go to Admin Panel / Appearance / Customize / Widget / Home Page Section widget area and add EM: Service Section. Refer below How to manage theme available widgets? for more detail. PRODUCT OF THE DAY: This section is set up from the widget.So you need to go to Admin Panel / Appearance / Customize / Widget / Home Page Section widget area and add EM: Categories Carousel. Refer below How to manage theme available widgets? for more detail. TOP SELLER: This section is set up from the widget.So you need to go to Admin Panel / Appearance / Customize / Widget / Home Page Section widget area and add EM: Featured Product. Refer below How to manage theme available widgets? for more detail. TESTIMONIAL: This section is set up from the widget.So you need to go to Admin Panel / Appearance / Customize / Widget / Home Page Section widget area and add EM: Testimonial. Refer below How to manage theme available widgets? for more detail. READ OUR BLOGS: This section is set up from the widget.So you need to go to Admin Panel / Appearance / Customize / Widget / Home Page Section widget area and add EM: Latest Blog. Refer below How to manage theme available widgets? for more detail. Footer Section: To set up this section you need to go to Admin Panel / Appearance / Customize / Theme Options / Footer Settings. For the Social icon, you need to assign the social menu to the Social Menu location. So you need to go to Admin Panel / Appearance / Customize / Menus / Menu Locations . Refer below How to manage General Settings Options? for more detail. If You do not like to manually set up the site as in the demo then there is nothing to worry about. With the release of the version 1.0.2, the theme has added a special feature where the user will be able to set of their site as in the demo through ” One Click Demo Import” plugin. The plugin is recommended by the theme which appears on the dashboard. Just click on the link and install the plugin and activate. After the activation of the required plugin, go to Admin Panel > Appearance. Here you will find the menu “Import Demo Data“. After clicking on the menu, a screen will appear with the button “Import Demo Data“. Click on the button. By following above steps you will be able to set up your site as in the demo. Tagline: It changes the tagline (i.e: Description) of the site.Just below site title. Choose Option: It has four different option from where you can choose to display any one of them. Logo Only: Choosing this option displays the logo only. Logo + Tagline: Choosing this option displays the logo and tagline. Title Only: Choosing this option displays Title only. 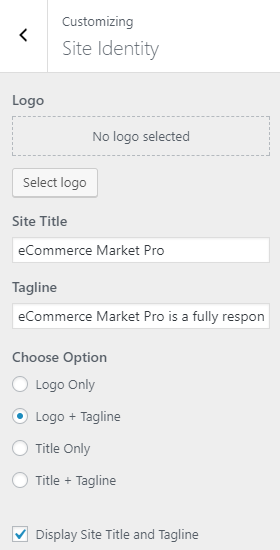 Title + Tagline: Choosing this option displays Title and tagline. Display Site Title and Tagline: It allows to enable and disable the Site Title and Tagline. 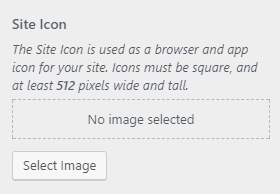 Site Icon: The Site Icon is used as a browser and app icon for your site.The icon must be square, and at least 512px wide and tall. 1. From Customize section, go to Colors Options..
2. From Colors Options, you will see Header Text Colour & Background Colour Options sections. 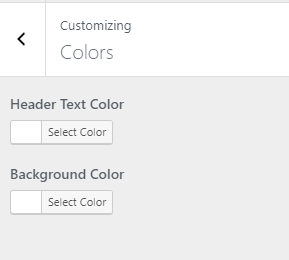 Header Text Color: Select the color available in the options. If the preview is fine, click on Save and Publish to apply recently selected Header Text Colour. Background Color: Select the color available in the options. If the preview is fine, click on Save and Publish to apply recently selected Background Colour. 1. From Customize section, go to Header Image. Select the header image of your choice . 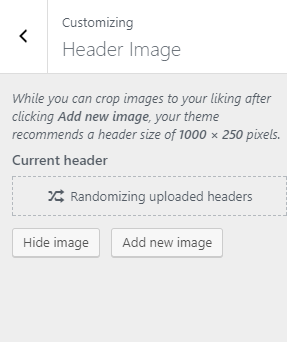 You can also set suggested image as header image. If the preview is fine, click on Save and Publish to apply recently selected image as Header image. 2. From Theme Options, you will see Header Settings Options. 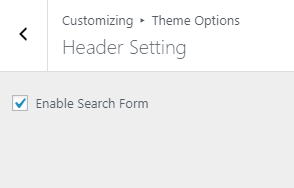 Enable Search Form: This option disable/enable the Search from in header. 2. 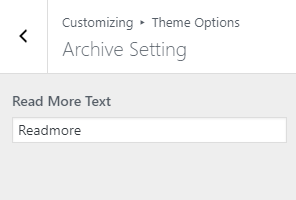 From Theme Options, you will see Archive Settings Options. Read More Text: This option enable you change the read more text. 2. From Theme Options, you will see General Settings Options. Layout Options: This option lets you chose the layout from three different available option. 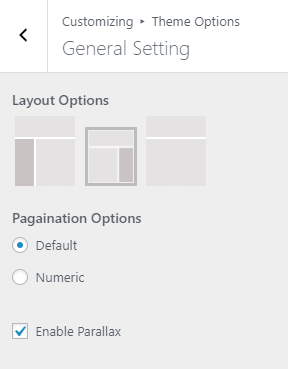 Pagination Options: You can chose the pagination type from the available two option options. 2. From Theme Options, you will see Footer Settings Options. Select Subscription Page:Select page from dropdown or leave blank if you want to hide this section. Address: From here you can customize the Address. Phone Number: From here you can customize the phone number. Contact Email: From here you can customize the contact email. Enable Social Icon: From here you can enable/disable social icon. Copyright Text: From here you can customize the copyright text for your site. Powered By Text: From here you can customize the powered by text for your site. 2. 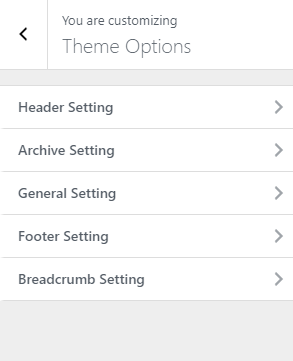 From Theme Options, you will see Breadcrumb Settings Options. Enable Breadcrumb:: This option enable/disable the breadcrumb options. 1. From Customize section, go to Home Page Options. 2. From Home Page Options, you will see Header Page Settings Options. 2. From Home Page Options, you will see Featured Slider Options. Enable Featured Slider: This option disable/enable the featured slider section. 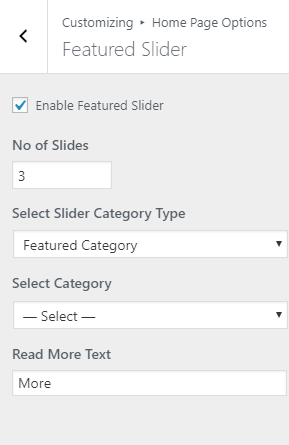 No of Slides: This option helps you to manage the no of slides to display. 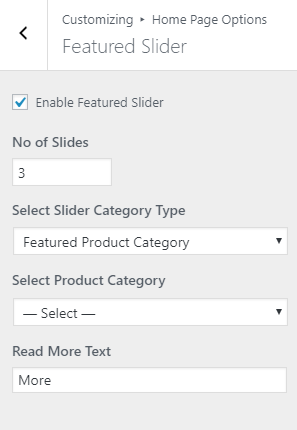 Select Slider Category Type: There are two available options which you can choose according to your requirement. Select Category: This option enables you to chose the category. Read More Text: This option enables you to change the read more text. Select Product Category: This option enables you to chose the product category. 1. From Customize section, go to Typography Options. 2. 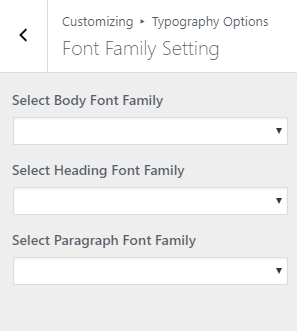 From Typography Options, you will see Font Family Settings. Select Body Font Family: You can change the body font form here. Select Heading Font Family: You can change the Heading text font from here. Select Paragraph Font Family: You can change the Paragraph and List Font from here. Save and Publish and refresh the page to see the font being reset. Primary Color: Select the color available in the options. If the preview is fine, click on Save and Publish to apply recently selected Primary color. Heading Tag Color: Select the color available in the options. If the preview is fine, click on Save and Publish to apply recently selected Heading Tag color. Paragraph Color: Select the color available in the options. If the preview is fine, click on Save and Publish to apply recently selected Paragraph color. Sidebar Widget Heading Color: Select the color available in the options. If the preview is fine, click on Save and Publish to apply recently selected Sidebar Widget Heading Color. Sidebar Widget Color: Select the color available in the options. If the preview is fine, click on Save and Publish to apply recently selected Sidebar Widget Color. 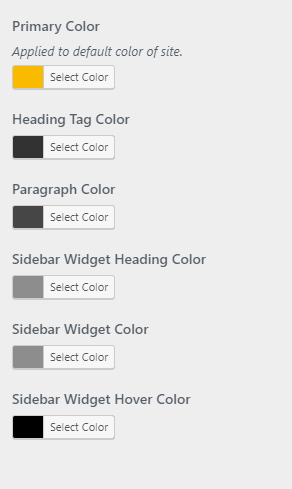 Sidebar Widget Hover Color: Select the color available in the options. If the preview is fine, click on Save and Publish to apply recently selected Sidebar Widget Hover Color. 1. From Customize section, go to Typography Options..
2. From Typography Options, you will see Header Color Setting sections. Top Header Background Color: Select the color available in the options. If the preview is fine, click on Save and Publish to apply recently selected Top Header Background Color. Search Form Background Color: Select the color available in the options. If the preview is fine, click on Save and Publish to apply recently selected Search Form Background Color. 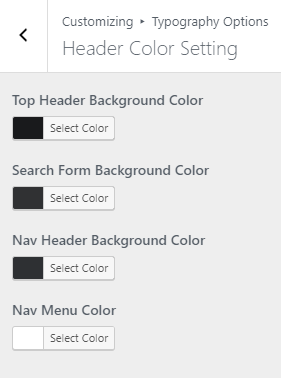 Nav Header Background Color: Select the color available in the options. If the preview is fine, click on Save and Publish to apply recently selected Nav Header Background Color. Nav Menu Color: Select the color available in the options. If the preview is fine, click on Save and Publish to apply recently selected Nav Menu Color. 1. From Customize section, go to Theme Options..
2. From Theme Options, you will see Heading & Footer Background Color Options sections. Subscription Background Color: In this section, you will see different color options. Now change the color as per your need. Footer Background Color: In this section, you will see different color options. Now change the color as per your need. 2. From Typography Options, you will see EM:Woo New Arrival Widget Options sections. Woo New Arrival Wiget Section Title: In this section, you will see different color options. Now change the color as per your need. Woo New Arrival Wiget Title: In this section, you will see different color options. Now change the color as per your need. Woo New Arrival Wiget Hover Color: In this section, you will see different color options. Now change the color as per your need. 2. From Typography Options, you will see EM:Product Carousel Widget Options sections. Product Carousel Wiget Section Title: In this section you will see different color options. Now change the color as per your need. Product Carousel Wiget Title: In this section you will see different color options. Now change the color as per your need. Product Carousel Wiget Price: In this section you will see different color options. Now change the color as per your need. Product Carousel Wiget Hover: In this section you will see different color options. Now change the color as per your need. Product Carousel Wiget Tag: In this section you will see different color options. Now change the color as per your need. 2. From Typography Options, you will see EM:Woo Tabs Category Widget Options sections. Woo Tabs Category Wiget Section Title: In this section, you will see different color options. Now change the color as per your need. Woo Tabs Category Wiget Title: In this section, you will see different color options. Now change the color as per your need. Woo Tabs Category Wiget Menu: In this section, you will see different color options. Now change the color as per your need. Woo Tabs Category Wiget Menu Active: In this section, you will see different color options. Now change the color as per your need. Woo Tabs Category Wiget Price: In this section, you will see different color options. Now change the color as per your need. Woo Tabs Category Wiget Hover: In this section, you will see different color options. Now change the color as per your need. Woo Tabs Category Wiget Tag: In this section, you will see different color options. Now change the color as per your need. 2. From Typography Options, you will see EM:Featured Product Widget Options sections. Featured Product Wiget Section Title: In this section, you will see different color options. Now change the color as per your need. Featured Product Wiget Title: In this section, you will see different color options. Now change the color as per your need. Featured Product Wiget Price: In this section, you will see different color options. Now change the color as per your need. Featured Product Wiget Hover: In this section, you will see different color options. Now change the color as per your need. Featured Product Wiget Tag: In this section, you will see different color options. Now change the color as per your need. 2. From Typography Options, you will see EM:Categoires Collection Widget Options sections. Categories Collection Wiget Section Title: In this section, you will see different color options. Now change the color as per your need. Categories Collection Wiget Title: In this section, you will see different color options. Now change the color as per your need. Categories Collection Wiget Description: In this section, you will see different color options. Now change the color as per your need. 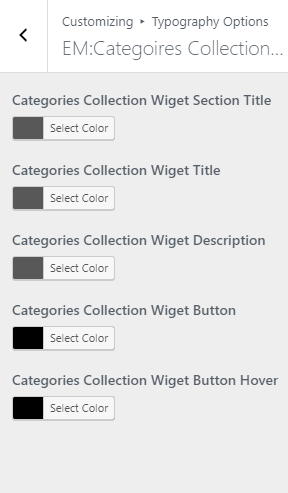 Categories Collection Wiget Button: In this section, you will see different color options. Now change the color as per your need. Categories Collection Wiget Button Hover: In this section, you will see different color options. Now change the color as per your need. 2. 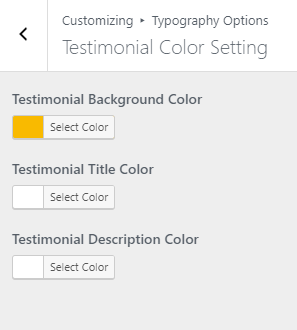 From Typography Options, you will see Testimonial Color Setting Options sections. 2. From Typography Options, you will see Latest Blog Color Setting Options sections. 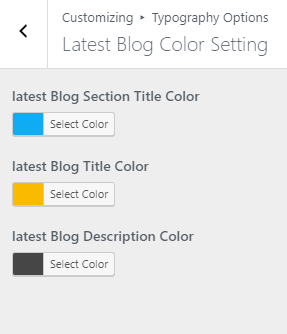 latest Blog Section Title Color: In this section, you will see different color options. Now change the color as per your need. latest Blog Title Color: In this section, you will see different color options. Now change the color as per your need. latest Blog Description Color: In this section, you will see different color options. Now change the color as per your need. 1. From Customize section, go to Menus. 2. 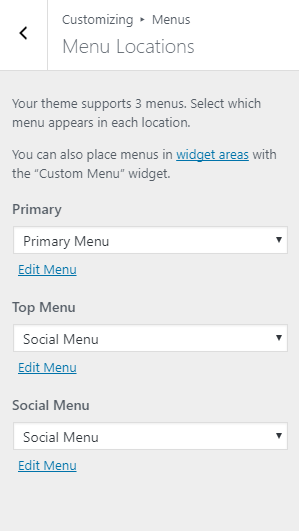 From Menus, click “Add a Menu” button and you will be able to create a menu. 3. Now, click Add Items and you will be able to Add or Remove Menu Items according to your requirement. 4. Select the Menu locations. 5. If the preview looks fine, save the changes by clicking on Save and publish button. 1. 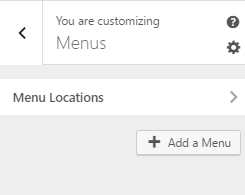 From Customize section, go to Menus and inside it, you will find Menu Locations. Select the menu for Primary Menu. The primary menu appears as the main menu in the header section. Choose the Top Menu. Top menu appears at the top. 1. From Customize section, go to Widgets. 2. From Widgets, you will see different sections to add widget where you will be able to Add a Widget or Remove widgets by going to particular widget section. 3. And the added widget will be displayed in particular section that you have added. EM: Categories Carousel : You will find options and settings in this widget. Now setup the widget according to your need. See the below image. EM: Categories Collection: You will find options and settings in this widget. Now setup the widget according to your need. See the below image. EM: Featured Product: You will find options and settings in this widget. Now setup the widget according to your need. See the below image. EM: Latest Blog: You will find options and settings in this widget. Now setup the widget according to your need. See the below image. EM: Product Carousel: You will find options and settings in this widget. Now setup the widget according to your need. See the below image. EM: Promo Widget: You will find options and settings in this widget. Now setup the widget according to your need. See the below image. EM: Recent Posts: You will find options and settings in this widget. Now setup the widget according to your need. See the below image. EM: Service Sections: You will find options and settings in this widget. Now setup the widget according to your need. See the below image. EM: Testimonial: You will find options and settings in this widget. Now setup the widget according to your need. See the below image. EM: Woo New Arrival: You will find options and settings in this widget. Now setup the widget according to your need. See the below image. 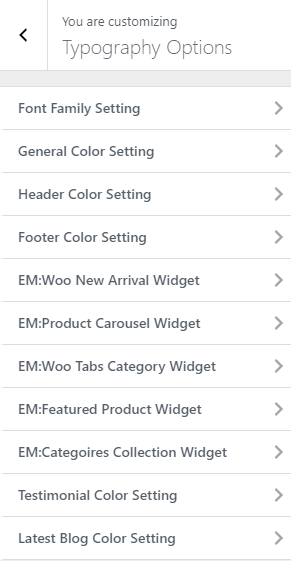 EM: Woo Tabs Category: You will find options and settings in this widget. Now setup the widget according to your need. See the below image. 1.From Customize section, go to Static Front Page . 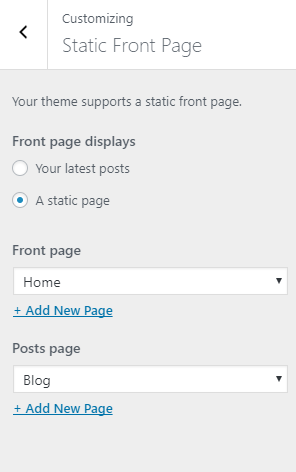 2.From Static Front Page, You will be able to set any page as A Static page and you will find Your Latest Posts page option as well. Using an FTP client to access your host web server, go to /wp-content/themes/ and upload your new copy of eCommerce Market Pro Theme which shall replace the old files.